Magic Mouse 2: How Good is This Mouse? Apple’s updates to Mac peripherals continue to be magical, at least in Apple’s eyes; for end users, there is enough magic in the mouse to keep attracting new users. The final results will be determined by how well the Magic Mouse 2, Magic Trackpad 2, and Magic Keyboard sell. Let’s start with the Magic Mouse 2, the second version of the Magic Mouse, which is by far one of the best mice Apple has come up with over the years. The Magic Mouse 2 underwent a slight evolutionary change that centers around the battery and its performance. Gone are the AA batteries that the user replaced when the batteries ran low. Instead, the new Magic Mouse has an internal rechargeable lithium-ion battery that Apple says can provide up to a month of use between charges. That’s about twice the amount of time most users get on rechargeable alkaline batteries used in the current Magic Mouse. The Magic Mouse 2 is available in two colors, the standard white top and silver bottom to compliment the looks of most of the Mac lineup, and a space gray model to go with the iMac Pro. In addition, the charging times are very impressive. A full charge takes as little as two hours, while a quick two minutes of charging is enough to give you 9 hours of use before the Magic Mouse 2 needs a refill again. That quick charge time is very important. Although your Mac will tell you well in advance that your Magic Mouse 2’s battery is low, many of us tend to ignore the warning and continue to work until the mouse actually turns off from battery depletion. The ability to be back up and working with only a two-minute quick charge is pretty amazing. Once you’re done for the day, you can complete the full charge, giving you another month until you forget to recharge the mouse once again. Charging is performed through a Lightning port on the bottom of the Magic Mouse. Turn the little rodent over and you'll see that the removable battery cover used in the original Magic Mouse is gone; now there's just a solid aluminum bottom with a single Lightning port between the guide rails. Apple supplies the Lightning to USB cable for charging, and your Mac can supply the power needed to keep the batteries charged. The downside is that the location of the Lightning port on the bottom of the mouse negates the ability to charge and use the mouse simultaneously. So, you'll have to take a coffee break for at least two minutes if you forget to charge the mouse up every month. The underside of the Magic Mouse 2 contains an on/off switch, tracking LED, and Lightning port for charging. Apple, Inc. Ever have problems getting a Bluetooth device, such as the Magic Mouse, to pair with your Mac? The Magic Mouse 2 solves that problem in a unique way. If the Magic Mouse 2 is unpaired, as it is when you first receive it, or if you manually unpair the mouse using your Mac’s Bluetooth preference pane, it can instantly be paired by simply connecting the mouse to your Mac using the Lightning to USB cable. The pairing is done for you, which is a nice touch, since using Bluetooth to perform the pairing can be troublesome if you're in an environment with lots of Bluetooth devices or Bluetooth-enabled computers. 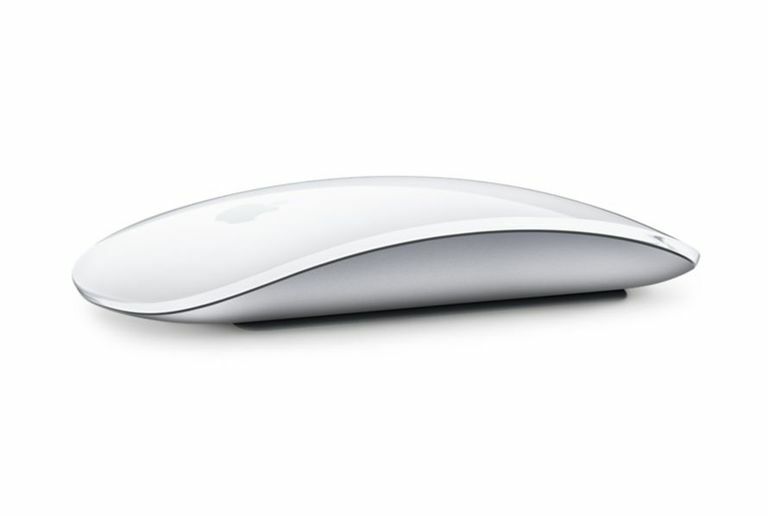 Other improvements for the Magic Mouse 2 include an improved feel to how it glides over a surface. With the removable battery door gone, Apple was able to tweak the glide sleds for an even better feel. To tell the truth, I’m not sure how noticeable that improvement will be for anyone. After all, the old Magic Mouse glided across most surfaces without skipping, sticking, or producing tracking errors. While it's fun to look at the improvements Apple made in the Magic Mouse 2, it's also important to note the lack of significant updates. Sure, it has a new rechargeable battery that has plenty of staying power and quick charge time, but you still need to plug the thing in to charge it, and you can’t use the mouse while it's charging. Experts were expecting Apple to provide an inductive charging system, possibly in the form of a mouse pad that, when the Magic Mouse was placed on it, started charging the mouse while allowing us to keep using it. There are also no new gestures, no larger or different gesture surfaces, and no Force Touch to produce a third type of click that the Mac could detect and use. The Force Touch system is in the new Magic Trackpad 2, so why not the Magic Mouse 2? The Magic Mouse 2 is a nice upgrade, maintaining the well-liked capabilities of the original Magic Mouse, and adding a rechargeable battery system. But I won't be tossing my original Magic Mouse away anytime soon. When the day comes that my Magic Mouse dies, then yes, the Magic Mouse 2 will more than likely be its replacement, but the changes aren't compelling enough to convince me to upgrade from my current Magic Mouse.